The Spectrum Series is Omnitech’s entry level CNC router. 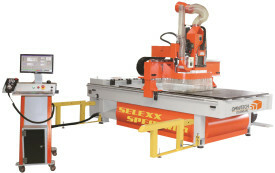 It is distinguished from other machines offered in this market by the Spectrum’s exceptional weight, speed and safety. The Spectrum Series is intended for flat panel processing of wood and plastic panels in 4’x 8’ or 5’x 10’ configuration. 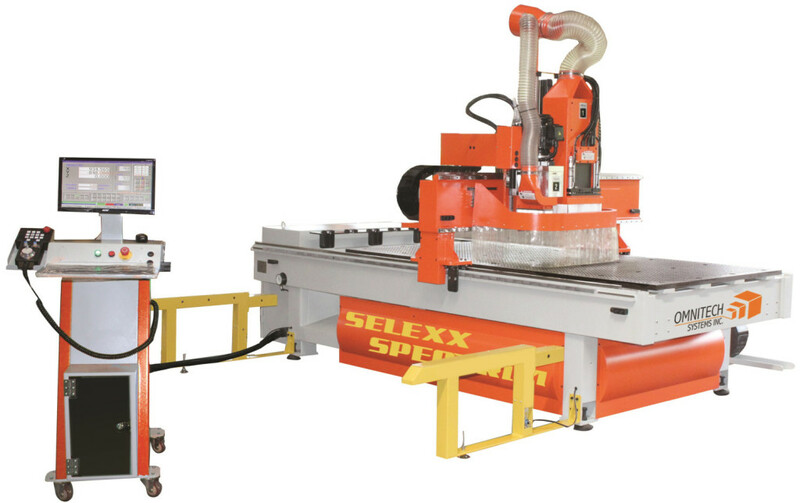 With our 10HP air cooled steel bearing spindle, 1HP, 6 x 32mm drill block and exceptional positioning speeds, the Spectrum Series can process up to 25 sheets of nested cabinet parts a day with our table vacuum/parts pusher. The Becker 250 m3/h vacuum pump offers secure clamping of parts. The FANUC Oi controller is easy to learn and use. With a friendly Graphic User Interface, the Windows 7 platform is easy to learn. Many common tasks are pre-programmed and executed at the click of the mouse. The fixed tool length measuring station, enclosed cutting area and photo cell safety fence are some of the safety features that are standard on the Spectrum Series and help to insure a safe work place. Each Spectrum Series machine is complete with a two year warranty, delivery, installation and training on site, on the machine purchased. We offer a copy of AlphaCAM Essentials CAM software with a training library of PDF files and videos, 1st year tech support and POST for the reduced price of $3,800.00 with every machine. A second Becker 250 m3/h vacuum pump may be added at higher elevations where needed. This requires a separate power source and switch. We offer a Parts Pusher / Table vacuum system for material off‐loading. The Spectrum Series is configured with a blast gate closure on the dust manifold to isolate the machine from your dust collection system when not in use. * a 5´x 12´ model is available for certain applications. Please call for more information. ** 4´ x 8´ sheets per day with material off loading.